We need your help to have the necessary tools and resources to combat discriminatory policies aimed at the LGBTQ community. 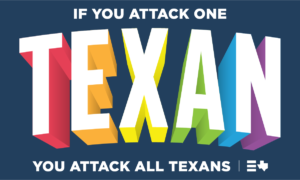 Your support is critical as we face a direct assault on LGBTQ Texans. Equality Texas serves as the largest nonpartisan statewide political advocacy organization working for the elimination of discrimination targeting the LGTBQ community. To support Equality Texas Foundation with a tax-deductible gift, go HERE. If you have questions about your contribution, would like to give by phone or mail, or need to update your credit card information please contact us: (512) 474-5475 or info@equalitytexas.org.